At the top of my priority list is my daughter. It was about 25 years ago, that she started noticing symptoms of loss of stamina, unusual tiredness, lots of pain, and seemed to be fighting low-grade flu-like symptoms every so often. They were the types of feelings that we all just dismiss (was I really feeling so bad?) and go on with our lives, hoping those body signals of something “just not right” will go away. And, to a point, they did, and no more thought was given. But, every so often, they were there again. Most times, they were almost unnoticed; other times, enough to force her to go about her daily activities of caring for her children, working full time, being a thoughtful, responsible person, by “pushing through” those symptoms, and then just falling into bed, exhausted. This went on for so many years until about 15 years ago, when she was already living close by in Florida. She came over for dinner one Sunday, with her then husband and her two daughters. They arrived in late afternoon, before dinner time, and she told me she needed to lie down. She was completely exhausted and just had to go to bed. It was like an emergency, and I hurriedly prepared the guest room bed for her, and she practically fell into it as I closed the blinds. She couldn’t move; and slept very soundly for hours. When she got up, she didn’t feel refreshed, but she was able to dine with us and then they went home right afterwards. It was from that point, that the symptoms would become more frequent and noticeable. Going to work was and is not an option as of this past January 2016. She really should have stopped work at least a year before. Looking back, she kept up her pace with great difficulty because she was a single mom and her younger daughter was totally dependent on her, and she worried about finances. She was living a physical, mental, stressful nightmare. My daughter suffers with the disease that is the reason for the letter below which is circulating in the House of Representatives on behalf of MillionsMissing (a global movement for health equality) and is addressed to Dr. Francis Collins, Director of the National Institutes of Health. We write to thank you for your attention to Myalgic Encephalomyelitis/Chronic Fatigue Syndrome (ME/CFS), and encourage you to continue to strengthen the National Institutes of Health’s (NIH) efforts in ME/CFS biomedical research. As you know, ME/CFS is a complex, debilitating, and chronic disease afflicting 1 to 2.5 million Americans. It costs individuals, the U.S. health care system, and our economy an estimated $17-$24 billion annually. Yet, as the Institute of Medicine noted in its report, “Beyond Myalgic Encephalomyelitis/Chronic Fatigue Syndrome: Redefining an Illness,” there has been “remarkably little research funding” to date to discover its cause or possible treatments. A number of us sent you a letter in March of 2014 to express support for ME/CFS research and are heartened by your commitment to advance diagnosis, treatment, and a cure for ME/CFS through a reinvigorated Trans-NIH ME/CFS Working Group (Working Group) housed within the National Institute of Neurological Disorders and Stroke (NINDS), and new intramural and extramural research programs that will bring new investigators into the field. We encourage the Working Group to consider in a timely manner the input received through its recent Request for Information (RFI) regarding emerging needs, opportunities, and strategies for ME/CFS research and research training. We also ask that you provide us with the current status of this planning effort and the specific intramural and extramural activities planned for the rest of FY 2016, 2017, and 2018. Thank you for your attention to these critical issues. We look forward to your response. The U.S. House of Representatives is currently circulating the letter asking the NIH to strengthen ME/CFS biomedical research efforts. NOW, is the time to contact your representative to ask him or her to sign the letter. Representatives have only until Wed., Aug. 31 to agree to sign the letter so action must be fast. Here is a “Prevalence of Well-Known Diseases” comparison chart by state, which compares the number of people in each state that suffers from ME, HIV/AIDS, Parkinson’s (PD), and Multiple Sclerosis MS). Myalgic Encephalomyelitis (ME) is quite short-changed as far as NIH funding, research and timeliness is concerned. Today, I came across an interesting article, dated January 12th, 2012, written by Vincent Racaniello, at the time Professor of Microbiology and Immunology at Columbia University. In preface, I have always wondered why the AIDS epidemic drew such huge attention in the public, media, scientific and governmental areas, and ME/CFS was pushed under the rug, so to speak. Of course, I can’t dismiss the fact that the AIDS epidemic caught the attention of the show business community, since it was in this venue that the infection became a highlighted problem. Big names in Hollywood and other celebrities, took up the cause to raise funds for research in the 1980s, and the government was caught up in the hurricane-like fanfare. Acknowledging that the HIV infection was extremely contagious to others, and that, in the beginning of the outbreak in the US, almost half of the patients died rather quickly; patients with Myalgic Encephalomyelitis and/or Chronic Fatigue Syndrome (a misnomer and huge insult to patients) are not contagious to other people. IMHO, ME sufferers are contagious to their own bodies; bodies that are losing the raging battle within. But, I digress. The article, part of which is quoted below, states very clearly, the differences between AIDS and ME/CFS as diseases, and how the scientific community and the US government departments (mostly the CDC in the beginning) did not take the seriousness of ME/CFS to heart. At the same time as the outbreak of AIDS in the 1980s, the CDC diagnosed ME/CFS as a psychological illness, dubbed it “CFS,” and diverted research funds to other areas. Until then, it was correctly called ME – Myalgic Encephalomyelitis, by the World Health Organization (WHO). 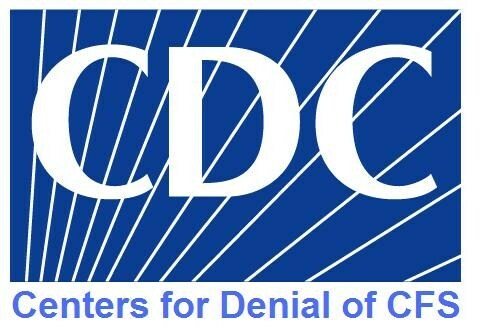 In contrast to their excellent work on AIDS, the CDC has stumbled when tackling CFS. The CDC has dismissed evidence that CFS is an organic disease, and spent funds on investigating psychiatric and trauma-related causes, rather than infectious origins. The agency also diverted funds designated for CFS to other programs. These and other missteps alienated the CFS patient community—the opposite of what the agency accomplished with the AIDS community. In part due to the standardized case definition of AIDS, identification of a candidate virus was relatively rapid. Determining its role in the disease was facilitated by the development of a blood test, which could be used to prove that HIV-1 caused AIDS. The relationship between HIV and AIDS was further confirmed by the development of antiviral drugs that inhibited viral replication and helped alleviate the symptoms of the disease. Why have investigators failed to identify a virus behind CFS? (It is not due to the lack of appropriate technology; this has improved substantially since the 1980s with the development of polymerase chain reaction and rapid DNA sequencing.) One explanation for this dilemma is that an infectious agent does not cause CFS. However, there is plausible evidence for an infectious etiology, including observations that the disease is known to occur in outbreaks. Furthermore, in many cases the onset of symptoms appears to begin with a flu-like illness. Additionally, CFS is a heterogeneous disease, and may be caused by several different agents or a combination of viruses and non-infectious conditions. Another possibility is that an infection initiates an immune response that spirals out of control, leading to CFS symptoms. This scenario implies that at least some CFS patients have underlying deficits in immune regulation. If that’s true, it will be very difficult to identify the virus involved because it will likely have been eliminated from patients’ systems by the time CFS symptoms become apparent. In retrospect, it is clear that the properties of AIDS made it an easy disease to understand. While the path to understanding CFS has been clouded by non-scientific issues, in the end the main reason why we do not understand this disease is because it is extraordinarily complex. But that never stopped a good scientist. The only thing that stops a good scientist is the lack of funding. This latest video highlights the need for basic teaching materials about ME in medical schools which are currently underrepresented. Current research includes learning from the past, integrating computer (artificial) intelligence, and it also will help with case definitions. Also being looked at are different ways of using multiple and varied and more complex modeling to understand how systems function. Prof. Jason states that the US government now recognizes that ME is not a “yuppie flu,” and affects many more people than originally thought, and that there are many organizations that are stopping the use of “CFS” are using alternative names; such as, ME or ME/CFS or Myalgic Encephalomyelitis. He believes that the current research has helped in that shift of designations. He also mentions that when deciding on a case definition, data and observations should be used, rather than consensus methods. What are the core features? This should be contributions to the debate that is currently ongoing in regard to these definitions. Involve professionals with environmental, public health backgrounds as well. He believes that ME is the greatest challenge to medicine we have today. What is really a puzzle for the medical community are the complex illnesses. He wants to get into the mechanisms that are involved in illnesses like ME and he hopes to have a new birth of understanding and what needs to have the greatest focus. Most important, is that adequate funding is necessary for the type of research that is needed to accomplish Prof. Jason’s goal of getting to the roots of what causes ME. I subscribe to many government newsletters and blogs. One is the NIH (National Institutes of Health) Director’s blog. His name is Dr. Francis Collins. The members of the GACD are: the United States, United Kingdom, Canada, Australia, China, and India, South Africa, Brazil, and the European Union. They are meeting in Shanghai as I write. However, my good feelings quickly found themselves dashed as a pumpkin would feel if it fell off the farmers’ truck onto the paved road on the way to market. I mean – smashed! My thought: “And add the more than 20 million sufferers of M.E. to that, plus the uncounted number who suffer from fibromyalgia, POTS and others I can’t think of to name right now. We’re talking about a big chunk of the world’s population.